Levira Ageless Facial Serum is an anti-aging product specially made and formulated to cater to men’s mature and aging skin. It provides better protection from future damage that can age your skin prematurely. It can also helps to boost your skin’s moisture content. Levira Serum – Does It Really Work? What are the Ingredients in Levira Serum? Does Levira Serum Have Any Side Effects? There is no information available about this product’s manufacturer, making it impossible to establish its maker’s successful track record in anti-aging skin care. Information about this product is also not available firsthand but rather, from third party websites. Levira Serum — Does It Really Work? Boost your skin’s moisture content and promote better skin hydration. Reduce the volume of facial hair and, thus, lessening the frequency by which you need to shave. Provide your skin with better protection from future damage that can age your skin prematurely. Lighten dark skin pigmentations and promote a brighter overall skin appearance. Retinol: Enhance your skin’s exfoliation, regeneration and turnover processes that significantly cutdown on the period required for younger-looking, lesser damaged skin layer to surface and replace the damaged top layer. However it causes redness or skin irritation. Plant-Based Ceramides: Supports the rebuilding and strengthening of your skin’s protective barrier layer, making your skin more resilient to damage and aging caused by both internal and external sources. Plant-Based Lipids: Soothe and calm your skin, these ingredients also promote enhanced skin healing that hastens repair and rejuvenation functions. Levira Serum is best used as part of your evening skin care ritual only because of its retinol content. It will be a waste to use this product in the morning because retinol easily breaks down when exposed to sunlight, and it also loses its ideal potency when it is subjected to heat. Levira Serum is an anti-aging product that has been specially formulated to cater to the anti-aging skin care needs of men. This product contains retinol to enhance your skin’s exfoliation, however it causes skin irritation. This formula also contains plant-based lipids Soothe and calm your skin. There is no available information online about what this product is formulated with, making it unsuitable for use by people with sensitive and reactive skin types. This product appears to have a limited availability online, and is not available on reseller websites and in physical beauty bars. Levira Serum reviews are severely limited, and independent reviews are practically not available, providing very limited information about actual user experience and evaluation about this product’s performance vis-a-vis its claims. Does Levira Serum Have Any Side-Effects? In the absence of a full list of ingredients and the limited number of product reviews available, consider that side effects may be experienced when using Levira Ageless Facial Serum. Try to avoid skin irritation and allergic reactions by performing an overnight patch test to check any sensitivity you may have against this product. Discontinue product use at the sight of any form irritation. 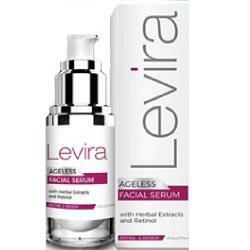 Levira Ageless Facial Serum is a notable product if only for being designed specifically with men’s needs in mind. However inviting this offer may sound, however, it isn’t the first product to offer a suitable anti-aging skin solution catering to men. Without the full ingredients list, however, it’s hard to tell how this product can be more beneficial than other similarly formulated men’s skin care products. There is no return policy available on this product.